We here at Tiger General have great pride in selling our Swabbing Equipment. However, some people may not be familiar with what the actual process of swabbing is. We wanted to write a quick blog post to explain the process to our readers. In short, swabbing is a form of “well control” that releases bottom hole pressure in order to “kick” the well off. When wells are first drilled, they are usually fractured by a pressurized liquid to help open up “production zones” where oil or gas can travel to. The next step is where the actual swabbing takes place. Swabbing rigs are then used to remove the fluids from the production zones. These swabbing rigs normally have a winch with a cable and a foldable mast with a pulley on top. 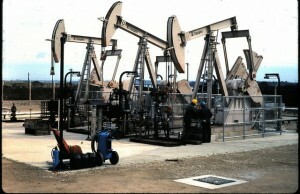 First, the rig operator must back the machine as close to the well as he possibly can. Next, the operator raises the mast and moves it until it is aligned with the center of the well. Next, the operator lowers the cable in and out of the well via the “winch drum”. Here, the operator must be able to maintain control of the machine while taking into account the well’s sound and depth. The activities of the swabbing rig then allow for the removal of the liquids inside the well. Standard practices involve removing 6 barrels of fluid out of the well. This practice if referred to as a “Run”. Some wells may take just one run while other may require multiple. Removing these fluids then causes the bottom hole pressure to increase. This allows the oil or gas to be pushed out of the well to cause it to start “flowing”. Oilfield workers may then start collecting and storing the natural resource that it being emitted from the well they are working on. As the well ages, the bottom pressure of the well may not be enough to push the oil and gas out of the well anymore. The well has then stopped flowing and the swabbing process needs to be started over again. If you’d like more information about Tiger General swab rigs please Download our Swab Master Rigs Brochure or Contact Us now to learn more at 330-725-4949. How much does it cost to get a gas well swabbed out? It is in Granger Township in Medina, Ohio. It used to be an oil well. If you don’t swab wells, can you give me the name of someone who does? I am looking for production in that area, do you know of any for sale? My father has a natural gas well on his property, he owns the mineral rights to this gas well. He uses the gas from this well to cook and heat with, he is having problems with the gas flow of this well, meaning it probally needs swabbed. He is elderly and lives on a fixed income and doesn’t have much money to do these kind things, do you offer any reduced rates for this kind of job for low income people. what are the costs associated with swabbing a well? That seems very high to have one swabbed in. I have been a swab operator for 5 years now and we only charge $130 a hour plus cups/oil savers and a tank if the location does not provide a tank battery. The guy who owns mineral rights does not pay for that well to be swabbed or run wireline or rework it. Their is a company who owns that lease ( the people who write him a monthly check) are responsible for the cost. Depending what the meter says they may not swab it, could need wireline on it to clean it up or move the perfs up to another zone. I am an absentee owner if a natural gas well that has not produced in a couple of years and produced little in the previous few years. I’ve been told that it needs to be swabbed to restart and would increase production significantly by the nsn who owns the pipeline ut is connected to. Now that I’ve retired I would like to take a more active role to make more money off my gas. As I’m sure you know, my share after the operator is done, is miniscule. I know they take the risk so I understand. But, is there a way to increase my portion? good info my gas pressure is way down think this is why ,has not been cleaned in 15 years.